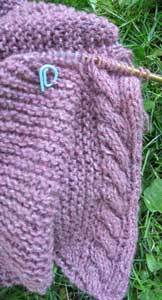 I have not been blogging but I have been knitting! I came across a number of projects that I had sitting in bags...begging to be held. I couldn't resist and picked up the oldest one. This shawl is made from Classic Elite Portland Tweed and the pattern is Sarsparilla. It is one of those knitting projects that I glanced at and thought, ":Oh, I'll just whip that up". Whenever I do that I get in trouble. I am not a good judge of time. Mind you, it is not that the project takes that long...it is just that I set an unrealistic goal. The project was set aside because the garter stitch was not going as fast as I wanted....so recently I was just doing a row a day and voila I was at the border. I got myself going on the border and absolutely adore doing it. The border is a 6 row repeat and is edging the whole garter stitch shawl. The edging is composed of a cable and a couple stitches that will be dropped and used for fringe once the cable edging is complete. I really want to just knit on it but there are so many fun competing interests! I am supposed to be spinning for the Tour de Fleece and started before the race and have not been spinning during. I must focus...tonight! Then, this Saturday(July 16th) at the store we are hosting the Ohio Fiber Natural Network and Destination Yarns ! It is going to be such a busy day, connecting with friends... looking at local fleece, dying, talking, spinning, crocheting, knitting.....yowser Don't miss it!